Cement Board Siding; Looks Like Wood, Lasts Forever. Cement board is a composite material using Portland cement, sand and natural fibers such as cellulose. It is sometimes called 'Fiber Cement Board', 'Cement Fiber Siding' and 'Hardie Board Siding'. It is made to long narrow boards that are nailed on the house just like real wood siding. It comes in several popular siding types and styles such as Dutch Lap and traditional lap. It also comes in Shakes and Shingles that mimic real cedar wood. Looks like real wood siding, but is much stronger. 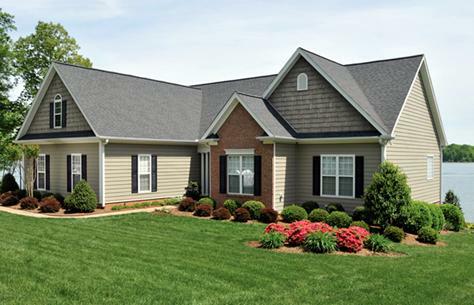 Much stronger than vinyl siding, cement board offers a tough alternative for areas where weather conditions are harsh. It is so strong and durable that many manufacturers offer a 50+ year limited transferable warranty. Cement Board Siding or Fiber Cement Board Siding is actually stronger than real wooden siding. And it is resistant to rot, bugs and moisture. Cement Board Siding offers a realistic product with rich textures form deep, authentic wood grains to ultra smooth finishes. It is Non-combustible so it will not ignite. Impervious to termites and other wood boring insects. Will not warp or rot like real wood. Stands up to freeze and thaw cycles better than real wood. Looks just like wood without the high maintenance of real wood. The fiber content makes the siding stronger and help prevents cracking. It takes paint very well allowing homeowners to re-paint every decade or so to give the house a fresh new appearance. Without the worrying about rot, termites or even high winds. Cement Board Siding is non-combustible so it will not ignite. Impervious to termites and other wood boring insects. Remodeling Magazine's 2013 review found that fiber cement siding provided homeowners approximately 80% return on their investment. This is one of the highest return on investments for any major home improvement projects for past 7 years. Can be ordered with factory primer applied or factory applied paint that will last 25 years. 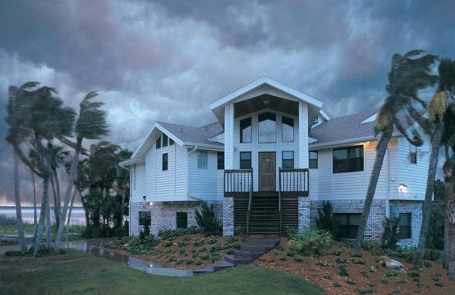 The perfect home siding product for harsh weather areas of the country. It is resistant to the negative effects of salt spray and UV rays so it is idea for coastal areas both in the North and the South. Fiber Cement Siding is made by different manufacturers and called different names. Sometimes referred to as 'Fiber Cement Siding'. The fiber content makes the siding stronger and help prevents cracking. It takes paint very well allowing homeowners to re-paint every decade or so to give the house a fresh new appearance. 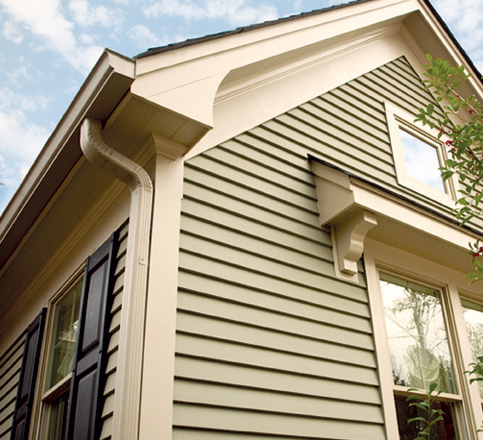 Hardie Board Siding is another fiber cement siding that is one of the most popular siding types in the U.S.
To see more about Hardie Board Siding click here. Cement board siding costs 25% to over 50% more than vinyl siding. It also requires professional installation. Since it is much heavier than vinyl siding it requires more workers to handle and hold it in place while being applied. 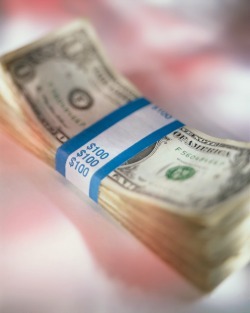 Labor costs are much higher for the contractor. Generally costs around $9 to $12 per sq ft installed. Since it lasts much longer than other sidings, the savings over time make up more than the difference in cost now. Cement board comes in many new colors. It is often pre-painted at the factory. Factory primed and painted fiber cement siding sometimes have 25 year + warranties on the paint. Cement Fiber Siding takes paint very well. So you can literally create unlimited custom colors to match any style. You can paint fiber cement siding any color. Cement board takes paint very well. You can use any good quality paint in any custom color to create what ever look you want. When comparing different products by different manufacturers, be sure to note the warranty, what it covers and what it does not cover. Fiber Cement Board comes in many different styles and textures. 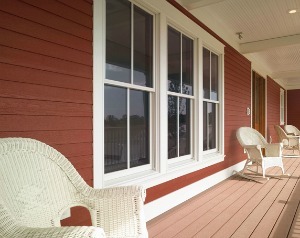 Fiber board siding can be used on most home styles from country estate to the suburbs. In coastal areas or wooded acres. Anywhere you need the strength and durability of concrete with the look of real wood. 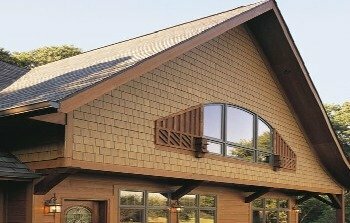 Can be used in conjunction with other siding types and styles. Looks great as trim on gables. To review more information on fiber cement siding click here. Engineered wood siding has the look and feel of real wood only much stronger and durable than real wood. 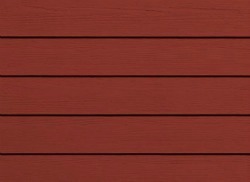 Click here to see more information on Engineered Wood Siding. Look at pictures of homes using vinyl siding on different styles of home click here Pictures of houses using vinyl siding. To see pictures of different styles of homes... click here.